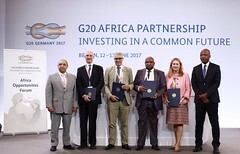 The OECD, Kenya, Italy and Germany launched the pilot Africa Academy for Tax and Financial Crime Investigation at the G20 Africa Partnership conference on 13 June 2017 in Berlin, Germany. Representatives of the four partners signed a Declaration of Intent to launch this academy, which seeks to strengthen the capacity of tax and financial crime investigators in tackling illicit financial flows. The sums lost to these flows, including tax evasion, money laundering, bribery and corruption are vast. In Africa alone, the 2015 Mbeki report estimates the losses in excess of 50 billion US dollars per year due to illicit financial flows. Illicit financial flows all thrive in a climate of secrecy, inadequate legal frameworks, lax regulation, poor enforcement, and weak inter-agency co-operation. Technology and an increasingly borderless world has also facilitated globalised financial crime, creating further challenges for those charged with investigating and prosecuting such crimes. This initiative, supported by the G7 Bari Declaration (May 2017), aims to provide demand-driven training addressing the specific needs of African countries and building on Africa-wide experiences and best practices in tackling illicit financial flows. The Africa Academy Programmes will cover all aspects of conducting and managing financial investigations, including complex money laundering and the role of tax investigators, investigative techniques, identifying, freezing & recovering assets, managing international investigations, and also specialty topics such as VAT/GST fraud. The Africa Academy is hosted at the Kenya School of Monetary Studies (KSMS) in Nairobi, Kenya. The Africa Academy Programmes are structured around a number of modules, which are taught through a combination of lectures, group discussions, practical exercises and course participant presentations. Please note these training programmes are only open to government officials. In this programme, participants will acquire a thorough understanding of the key skills required for conducting financial investigations, including the ability to follow the money through complex financial arrangements and how to effectively use sophisticated techniques to identify links between suspects and their illicit activities. This more advanced programme on managing financial investigations is primarily focused on participants with managerial or supervisory responsibility. The modules offered include leadership skills; effectively managing limited resources; international evidence; prosecutorial and investigative challenges; threats and risks assessments; illicit flows, including complex money laundering and the challenges of bribery and corruption cases; best practices and international initiatives. This Specialty Programme on Value Added Tax (VAT) / Goods and Services Tax (GST) fraud is intended for investigators and/or managers with experience in the investigation and prosecution of VAT/GST frauds. The Programme explores the threats and risk assessment around various types of VAT/GST fraud, investigative techniques and their challenges and best practices, asset seizures and the money laundering issues associated with VAT/GST fraud, as well as prosecution challenges and best practices. This Specialty Programme on Asset Recovery: Freezing and Seizing Assets is intended for investigators and/or managers with experience in freezing and seizing assets resulting from the investigation of tax crimes and other financial crimes. The Programme will provide an overview of the legal measures associated with asset recovery, explore the use of restraining orders, consider both conviction based and non-conviction based confiscation of assets from the proceeds of crime, and provide a snapshot of international asset recovery initiatives, as well as the challenges and best practices in this field. To provide support and capacity for participating countries to translate international best practices into their domestic laws and operations.